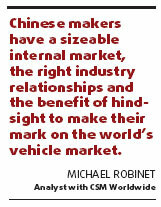 Carmakers maturing, but can they go global? In many cultures, families hold a celebration signaling that a teenager is ready to transition into adulthood - a coming of age. Many global observers look to last year's Beijing Auto Show as a sign that China's vehicle manufacturers are ready to take a similar step toward maturity on the discerning and competitive global stage. With a newly expanded venue in Beijing, several manufacturers took the opportunity to show a range of offerings seemingly engineered with global exports in mind. Chery, Geely, FAW and SAIC all raised their game significantly last year, as did several other smaller China-based auto producers. Each used Beijing as a launching point to debut vehicles and technologies to prepare for expansion in China and other markets. Possibly the most important introduction last year was the Roewe 550 compact sedan - designed completely by SAIC with its big brother the Roewe 750 as a starting point. Not shared with either of its partners General Motors and Volkswagen, the 550 is crucial to SAIC's ability to expand in China and abroad on its own terms. The sedan's level of technology integration, fit and finish as well as styling signaled to the world that China is ready to truly become a global force in the highly competitive industry. The Roewe 550, as well as other China-designed offerings, impressed many foreign vehicle makers. They surely took notice of the tremendous progress and, more importantly, the looming competitive threat from China. This year's Shanghai Auto Show will be part of continuing this maturation, especially amid global economic turmoil that has placed the automotive industry flat on its back. Impressing global visitors with a display of substantial progress in vehicle design, value, content, technology and build quality is the number one priority for the Shanghai show. Despite the financial condition Detroit's Big Three and poor output driven by the massive inventory correction underway in Japan and Europe, China's players face a changing competitive future. The current economic downturn, the focus on lower global dependence on fossil fuels and the importance of a vibrant domestic automotive industry for most industrialized economies adds to the challenge of future market success for the Chinese. The prospect of automotive protectionism lurking within various Western economies' domestically focused policies should concern everyone in the industry. For over three decades, substantial bilateral and multilateral trade agreements have increased economies of scale and vehicle build quality, lowered overall costs and placed today's vehicles within reach of more consumers than ever before. Breaking down tariff walls has been one of the driving forces behind expansion of the global automotive industry. Poorly conceived nationalistic policies seeking to inefficiently protect employment could sacrifice the long term for short-term political gains. Global leaders need not make the same protectionist mistakes from past economic downturns. The industry's globalization is real, substantial and cannot be shifted into reverse. The best option is to forge ahead as one industry, seeking the most efficient solutions to our myriad of complex issues. Another challenge facing all industry participants includes technology access, implementation and integration. Today's discerning consumer is expecting more from less. More content in the form of in-car communications, audio capability, passenger comfort and occupant safety is critical. Consumers will also be expecting less, such as vehicles with smaller mass that consume less fuel with lower carbon footprints. China's vehicle manufacturers knew long ago that beyond fruitful associations with global vehicle makers to understand how to design and build the vehicle, the key to success abroad is the seamless integration of state-of-the-art technology through relationships with Western component suppliers.